Soft and chewy, these cookies bake up quickly and only dirty two bowls in the process. While I love the pops of color from the pistachios, swap in another nut if you’d like (or omit altogether to keep them nut-free). Because of the high moisture content from the fresh carrots, the cookies are best eaten within 2 days of baking. 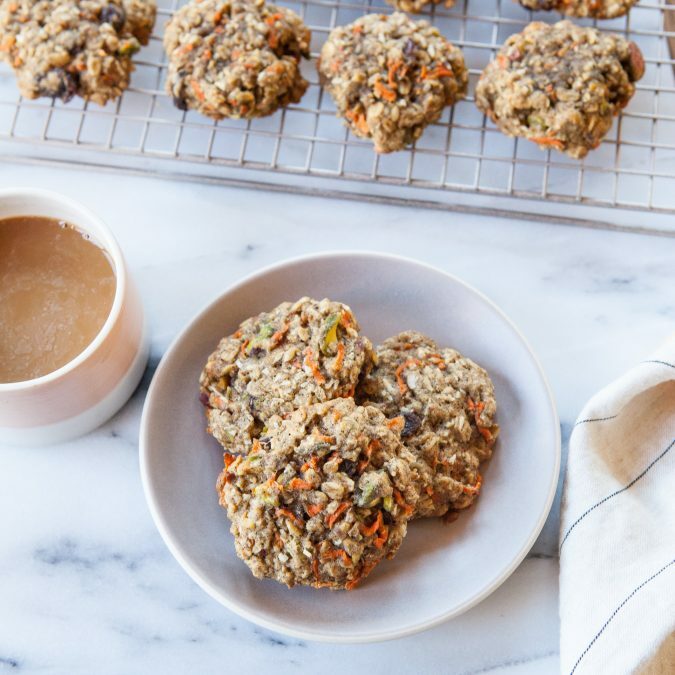 I often freeze a few to have on hand for those late mornings when a warm, whole grain cookie sounds like just the thing. Preheat the oven to 350F. Line a large baking sheet with parchment paper or a silicone mat. In a large bowl, whisk together both flours, oats, cardamom, cinnamon, ginger, salt, baking soda and baking powder. In a separate medium bowl, whisk together the coconut oil, maple syrup, egg, and vanilla extract. Pour the wet ingredients into the flour mixture, folding in with a wooden spoon until incorporated. Stir the carrots, pistachios, coconut and raisins into the dough until combined (feel free to use your hands and get in there to give the dough a few turns to ensure all the dry ingredients are incorporated). The dough will be super sticky; that’s ok. Let the dough rest for 10 minutes. Scoop out 2 tablespoons of dough and, working quickly, form a ball using your hands. Place the balls about 1 ½ inches apart on the prepared baking sheet. Gently flatten the cookies with the palm of your hand to about ¾ inch thickness. Bake for about 12 minutes, or until slightly golden brown around the edges and firmed yet still soft in the center (they’ll continue to firm up as they cool). Let the cookies cool for 10 minutes on the baking sheet, then transfer to a wire rack to cool completely.